Downtown Minneapolis is tipping over! Just kidding. 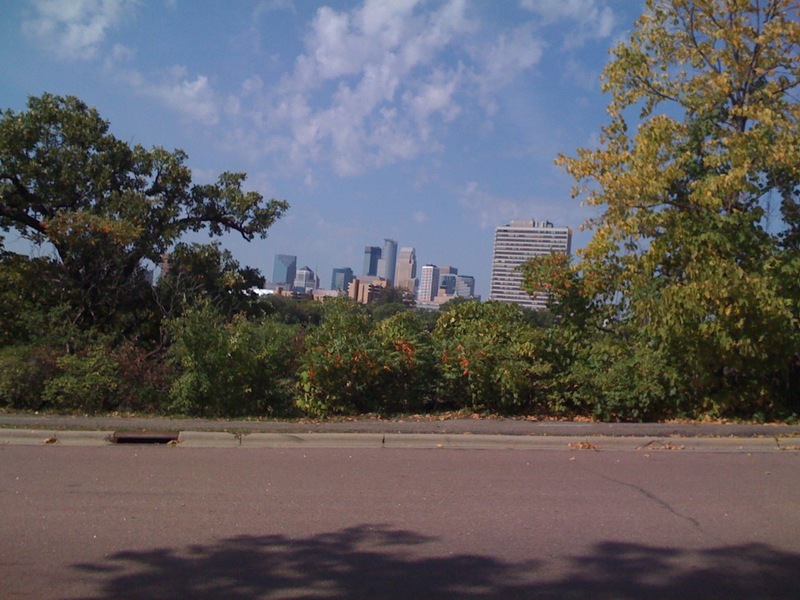 It’s just an optical illusion from this photo I took yesterday on an incline on the East River Road on the University of Minnesota campus. I’ve always been a bit wary of revealing too much information about myself online. Given some past incidents with (admittedly indeterminate) potential for danger to my person, it’s been clear that there is no anonymity online. That said, I’ve taken some solace in the fact that my name is common. So common, in fact, that I don’t even mind stating online that I live in Minneapolis, because last time I checked, there were a column and a half of Scott Andersons in the Minneapolis phone book, and I’m not even one of them! But I’ve always kind of had this idea that I’m “the” Scott Anderson of the Internet. I figured that I’m so immersed in this stuff and have been for so long (having created my first website in 1994), and I’ve encountered so few other Scott Andersons online that I must, therefore, have the greatest online presence of any of the world’s (approximately) hundred megabazillion Scott Andersons. A quick Google search taught me how wrong I was. It’s not just that there are a lot of other Scott Andersons online; they all seem like they’re more me than me: musicians, writers, photographers, all manner of creative activities. And I (the real Scott Anderson) didn’t even show up until page 5 of the results! So now it’s clear to me that I need to become a little less anonymous! Either I need to plaster my name all over everything I do, or I need a less common name. Given my inherent laziness, I’m inclined to go with the latter. I wonder if Griddlecake K. Catafalque is taken.